Dental implants are an ideal solution to replace lost teeth permanently while giving the most natural feeling results. They are currently the best solution to missing teeth. Dr. Sona Asatryan offers affordable dental implants in Pasadena for those looking to replace their missing teeth. 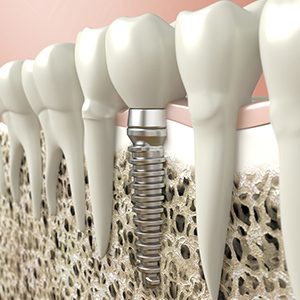 A dental implant is a screw-like metal prosthesis meant to replace the lost root of a missing tooth. The implant is placed within the jawbones and supports a dental prosthesis with a portion that protrudes over the gums. Implants are made of titanium, which completely fuses with bone, incorporating itself into the bone structure via a process known as “Osseointegration”. This phenomenon is what makes implants unique in the replacement of lost teeth. We do not prefer to disclose our dental implant prices online, however, if you would like to find out the cost of dental implants in Pasadena, then please call our office @ 626.431.2654. Our dental implant prices are competitive, affordable, and representative of the quality you can expect to receive. Are You a Good Candidate for Dental Implants in Pasadena? To find out if you’re a good candidate for dental implants in Pasadena, either call our office @ 626.431.2654 or conveniently fill out our form below and we will respond to your inquiry as soon as possible. Thank you for your interest in choosing Fair Oaks Dental Group.